Suppose a hungry boy goes to an orchard and starts shaking an apple tree. Nothing happens. He prays to God for help and shakes the tree again. He is so caught in looking at the apple tree that he doesn’t notice mangoes falling from a nearby tree. Like that child, we too frequently let our expectations restrict our vision. When we tackle a problem through endeavor and prayer, we often expect a particular answer and close ourselves to other possibilities. But God is not limited by our expectations – he can solve our problems in other, often better, ways. To cultivate openness to possibilities, we need to protect our thoughts from being locked in our work and its result. 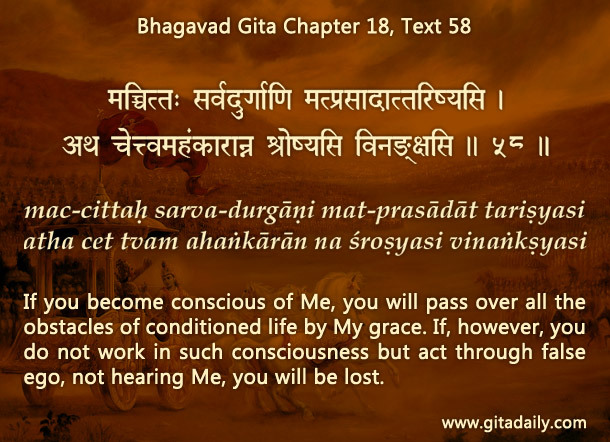 The Bhagavad-gita (18.58) assures us that if we become conscious of Krishna, he by his inconceivable grace will help us pass over whatever obstacles come our way. Becoming conscious of Krishna doesn’t mean becoming inattentive towards our work or apathetic towards its results. It means becoming aware that our work doesn’t act in isolation as the sole producer of a linearly-determined result. Our work is just one part of a cosmic chain of causes and effects. Indeed, we ourselves are parts of something much bigger; we are parts of the Supreme Being, Krishna. And he can act for our well-being in ways that may not be immediately connected with our work. His ways produce the results we need, but not always in the way we had expected. The child was provided food, just not from the tree he was looking at. By practicing bhakti-yoga, we can expand our consciousness, thereby increasing its openness to Krishna’s infinite possibilities. Amidst problems, if we persevere faithfully without being disheartened by seeming non-responses from him, we will soon witness his magical benevolence.